In this post, I talked about what we can deduce from the unredacted parts of the Mike Flynn 302 released last night. It shows that Flynn’s lies served to hide that he consulted very closely with Mar-a-Lago — almost certainly with Trump — and even denied parts of the transcript that showed him quoting directly from KT McFarland’s related instructions. While we’re waiting on Flynn’s sentence, I’d like to look at the substantive redactions, as a way of assessing what Mueller thinks must remain secret. I’ll just be looking at the actual report, not the bureaucratic redactions (which hide things like the case number and classification levels for the individual paragraphs). The first redaction comes in a paragraph recording what Flynn claimed were his past communications with Sergei Kislyak, in which he explains that he called Kislyak in the wake of the death of GRU head Igor Sergun in January 2016. It’s possible the redaction includes an admission that he and Kislyak discussed policy — ascribing a a policy call to a condolence one is precisely what he did with the December 29 calls to Kislyak, after all. Note, too, the way Flynn distanced that conversation from Trump (he probably figured out that that call, like his much later one, would have been picked up). It’d be especially interesting if the redaction pertained to Flynn’s claim that Sergun died in Lebanon; Russia’s military issued a panicked denial today that Sergun died there (they say he died of heart problems in Russia). The second redaction hides Flynn’s discussion of his trip to Russia in 2015, on a trip ultimately paid by RT, where he sat at a table with Vladimir Putin and Jill Stein. This actually might be hidden for counterintelligence reasons — to hide the circumstances of how Russians tried to sidle up to Flynn by flying him in for the gala. That said, the details are likely part of Mueller’s understanding of how Russia cultivated Trump and those close to him. The next redaction hides Flynn’s description of the outreach to the Russians he was making. I suspect this provides more detail about the outreach Flynn made on Syria. He portrays it as pertaining to terrorism, not paying back Russia. The hidden passage may also address timing which we now know actually started during the election (which would mean this redacted passage could hide yet another Flynn lie). Note, it’s actually fairly interesting that Flynn worked exclusively via Kislyak, but none of that is likely to be redacted. 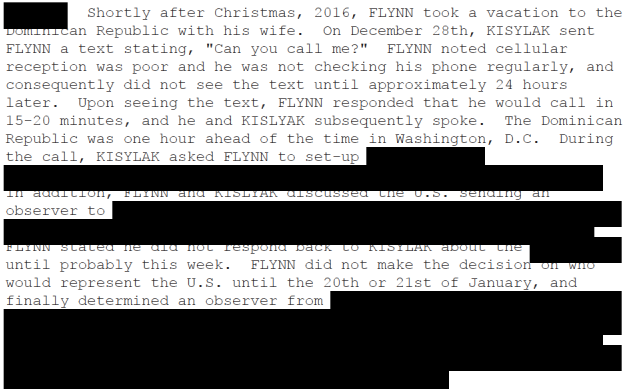 The first paragraph about the December 29 conversation hides two details: what appears to be a request that Flynn set up the conference call that ultimately took place on January 28, and an inquiry on whether the US would send observers to … something. This redaction is one I expect we’ll get follow-up reporting on, as Kislyak was making significant asks at that time. The longest redaction in the 302 may be the one that hides Flynn’s description of the December 1 meeting with himself and Jared Kushner (Don Jr came in at some point — the meeting was conducted in his office) where Jared asked for a back channel of communications. I find the extent of this redaction … to be bad news for Jared Kushner (and Don Jr if he attended more of the meeting than he claims). This is another meeting that FBI had details about (or later would discover them), from when Kislyak called home and reported on the back channel request. A significant purpose for this redaction must be to hide what Flynn said from the other co-conspirators. Also note: if this meeting is the only other communication with Kislyak that Flynn admitted to, he may have also hid communications he had during the election (in which case those communications would have also been considered sensitive). These two words are the only ones redacted in the entire three-paragraph passage describing Flynn’s lies about the vote on Israeli settlements. The redactions here — at least the second one — are for diplomatic reasons. I believe the second one hides the word “Egyptians;” I’m not sure if the first is long enough to be “Israel.” It may be “Trump,” in which case it’d be another point where Flynn hid how much he coordinated with Trump on all this. In any case, the fact that Mueller redacted so little of this discussion suggests that the effort to help Israel is not a core part of his investigation (or if it is, Jared, who ordered Flynn to try to delay the vote on Israel, has already locked in his testimony on it). It’s unclear what this redaction, in the first paragraph as the FBI Agents circled back to Flynn’s lies about the sanctions call, hides. It may be another reference to the discussion about sending observers somewhere. That’s the final redaction, though. The rest — which details how the Agents quoted directly from the transcript (including the bit that was itself a quote of KT McFarland) is all unsealed, so presumably no longer sensitive from an investigative standpoint. All of which is to say that the most sensitive investigative detail in Flynn’s 302 — the thing the government cared most about hiding — is what Flynn said about that December 1 meeting where Jared asked to set up a back channel of communication with Russia.